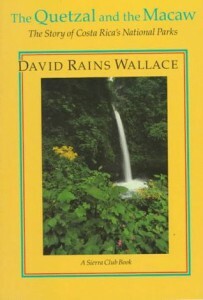 The Quetzal and the Macaw: The Story of Costa Rica’s National Parks, David Rains Wallace, Sierra Club Books, 1992, ISBN 9780871565853, 222pp. Jill and I have been planning to take a vacation for the last six months. Actually, we’ve been talking about it for the last eight months, and Jill was able to finally plan for it these last two. We had a hard time finding a travel agent who understood what we wanted to do on a trip. We’re no O’Hanlon or Newby type travellers, but then we’re not the “you-can-eat-at-all-hours-of-the-day-and-isn’t-that-wonderful” cruise ship voyagers either. We’d say “eco-travel” or “adventure travel” to an agent in the Tri-Cities and they’d give us their best bow-headed stare. We found one agent who was willing to try to set a trip up for us based on some flyers we had picked up, but when she finally managed to put together an itinerary, it was out of the price range we had specified. Jill picked up the card for a new agent when we were last in Portland visiting Powell’s Travel Store, and was referred to their Costa Rica expert. Why Costa Rica? We wanted something somewhat rugged since the last trip we took out of the continent had been to London. I had been pushing for the Galapagos Islands since reading Gould’s Ever Since Darwin, but that turned out to be too expensive. The brochures we picked up glowed with Costa Rica’s glories, and it seemed to be in our price range– and it was. Jill pressed me to find a book about Costa Rica (a travelogue or similar, but not a guide book) since she had done the planning and agent interface. I couldn’t find an armchair travel book, but I did discover this excellent book on the formation of Costa Rica’s national park system. 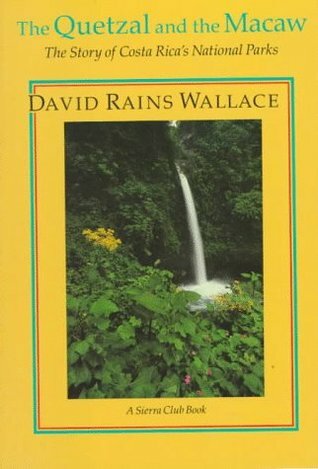 This is more of a history than a travel narrative, although the author did visit Costa Rica and its parks several times and gives his impressions of the area. It follows the combined attempts to set aside land for species habitat and ecological preservation, from the working of a couple of expatriated Norwegians through the two young university students who became the leaders of the National Park Service. Many of Costa Rica’s park worker has been ahead of its time, especially for the area of the world in which it is being done. I am excited to see what I have read about, not only the good things like the parks themselves, but the parts that haven’t gone quite right because of the need to balance on the fine line between preservation and tourism.